This post is written by Walker Evans, founder of Columbus Underground. You can follow Columbus Underground on Twitter @ColsUnderground. 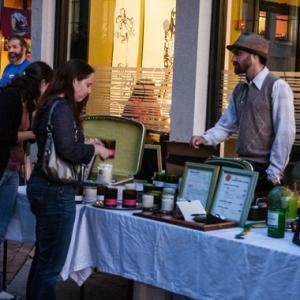 The Moonlight Market on Gay Street is closing out it&apos;s inaugural 2013 season with a final installation this Saturday evening Dec. 14) from 6 p.m. to 11 p.m. If you&apos;ve attended any of the monthly events this year, then you&apos;ve already discovered the dozens of participating sidewalk merchants, the brick and mortar businesses that keep special late night hours, and the entertainment that comes with dining, drinking and shopping Downtown under the moonlight. • A relocation of sidewalk vendors indoors to the large main floor space inside the Residence Inn (located at 36 E. Gay Street) for a large pop-up shop. Over 30 local artisans, merchants and small businesses will be set up to sell holiday gift items ranging from candles to clothing. • The ability to sip-and-stroll! The Residence Inn boasts a mezzanine-level bar that overlooks the indoor event space, and shoppers can partake in beer, wine or cocktails as they browse the local retail selections. Additionally, DJ Charles Erickson (from the popular long-running Clampdown dance party) will be providing music from the mezzanine all evening. • Additional pop-up merchants will be located at other businesses on the street including spots within Cafe Brioso, Sugardaddy&apos;s, Robert Mason, 39 Below Fro Yo and others. • While the retail event is all about providing opportunities to shop local for your holiday gifts, the season is about much more than just shopping. Volunteers are decorating the street with luminaries that will make a great night-time stroll while sipping hot chocolate from Brioso. There will be carolers who will be singing throughout the district, and the Alternative Fashion Mob will be providing a donation-based gift wrapping service on site to help get you ready for the big day.